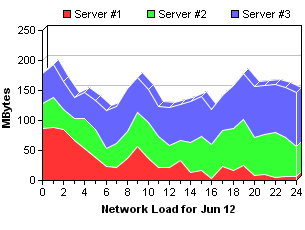 A 2D stacked area chart, with legends at the bottom of the chart. Note the y-axis labels are "US$nnn". 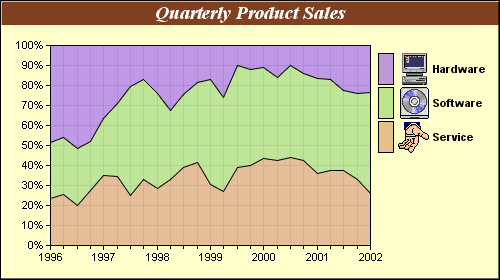 ChartDirector uses a template system to support flexible formatting of axis labels. An area chart in which the area is filled with a pattern. ChartDirector extends the concept of colors to include patterns, so everything can be colored with patterns. The title background is a pattern too. It is a 1 x 2 pixel wallpaper pattern. A 3D area chart using 3 area layers. Semi-transparent colors ensure bottom layers remain visible. 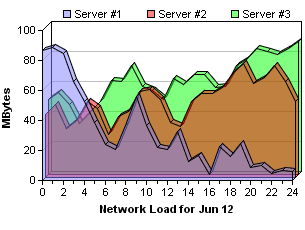 A 3D stacked area chart. A nicely designed area chart, using semi-transparent gradient color for the area region. 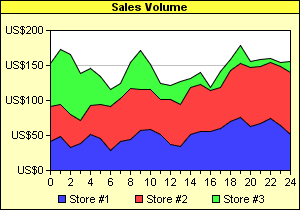 The chart title, axis title and logo are created using CDML, so they can contain icons. 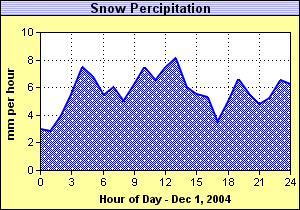 A percentage area chart, in which the areas are automatically scaled so they always stacked up to 100%. The legend keys are created using CDML, so they can contain icons. 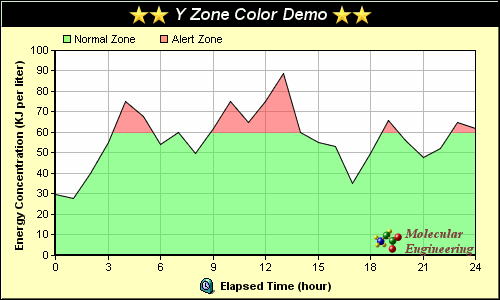 An area chart demonstrating the zone color feature of ChartDirector. Zone colors are colors that can change abruptly at user-defined threshold positions. In this chart, the area is filled with a zone color configured to change at y = 60.